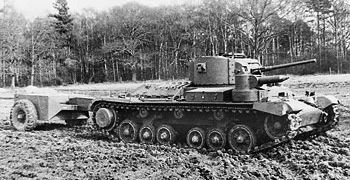 The British World War 2 Valentine Tank nick-name should not be confused with a romantic relationship the British Army had with what was a successful design and represented 25% of the total tank production in the UK during World War 2, but rather the day Vickers submitted its design to the War Office. 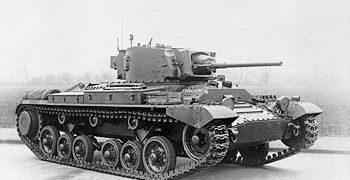 Production commenced around 1940, with a total of 3 UK firms manufacturing the vehicle – Vickers, Metropolitan Cammell and Birmingham Carriage, which totalled 8275 when production ended in 1944. It was also built in Canada (numbers 1420) where they were shipped to Russia under the Lenda-Lease program. A Mark II using an American 138 hp GMC 6004 diesel engine and US-made transmission. Though it had slightly shorter range, it was quieter and more reliable. Canadian-built version of IV. It used some Canadian and American mechanical parts. Late production vehicles had cast glacis detail. First few produced with a 7.92 mm Besa coaxial machinegun, soon replaced by a 0.30 inch Browning coaxial machinegun. Another Canadian version, it was essentially the VI with internal changes and a different radio set. Mark VII with jettisonable fuel tanks, new studded tracks, and protected headlights. A III upgraded with the QF 6-pounder gun. In order to fit it, the coaxial machinegun and the loader crew member had to be removed. The side armour was reduced again. Crews came up with a novel way of using a machinegun from inside the hull by fitting a solenoid-fired Browning MG into a 6-pdr shell-case. When needed, this was inserted into the 6-pdr breech and the solenoid cable connected, allowing the gunner to aim it using the main gun elevating gear, traverse and telescope. 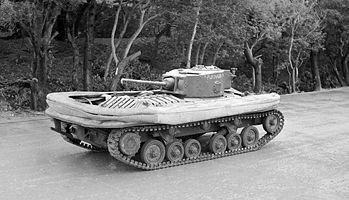 Valentine Mk V, IX and Mk XI, made amphibious by the use of Nicholas Straussler’s Duplex Drive. Used by crews training for the M4 Sherman DD tanks of the Normandy Landings. Observation Post and command version with extra radios. To give more space inside, the gun was replaced with a dummy. Mine exploder, turret-less with flail attachment. Never used operationally. 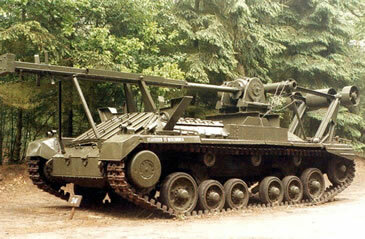 Mine exploder with Armoured Mine Roller Attachment. Never used operationally. 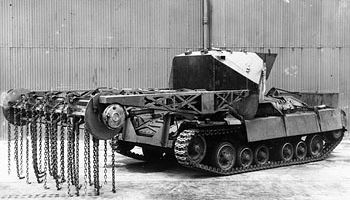 An armoured bridge-laying vehicle; a turret-less Mk II fitted with 34 ft x 9.5 ft Class 30 scissors bridge. Several dozen were produced, some of them supplied to the USSR. 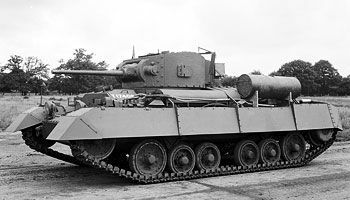 Experimental vehicle built by Vickers-Armstrong to examine the possibility of producing a simple tank destroyer by mounting the 6pdr in its field carriage on the hull in place of the turret. Trials only, 1942. 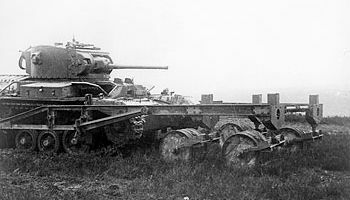 Two Valentine tanks were modified to carry flamethrowers. These were tested by the Petroleum Warfare Department to determine which system was best for a tank-mounted flame projector. One used a projector ignited by cordite charges and one used a projector operated by gas pressure. 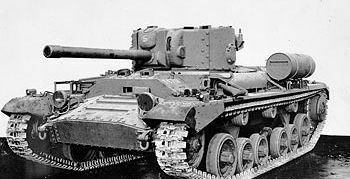 The flamethrower fuel was carried in a trailer and the flame projector was mounted on the hull front. Trials started in 1942 and it showed that the gas-operated system was better. 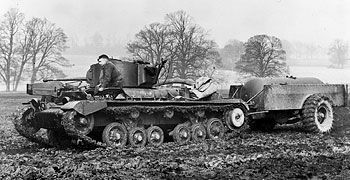 From this test installation was developed the Crocodile equipment for the Churchill Crocodile flamethrower used in the North West Europe campaign in 1944-45. 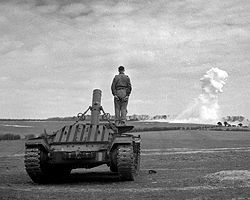 Experimental vehicle with turret replaced by fixed heavy mortar intended to fire 25 lb TNT incendiary shells to demolish concrete emplacements. Trials only by Petroleum Warfare Dept, 1943-45. Effective range was 400 yards (maximum range 2,000 yards).